I’m still getting used to Brian Michael Bendis being at DC. It still doesn’t feel natural to me. That being said I am really enjoying what Bendis has been doing with Superman and Action Comics but I became excited when Bendis announced his new initiative, Wonder Comics. Wonder Comics is intended to be a line of comics populated with teenage hero comics with both classic characters and concepts with a mixture of new heroes and new takes. Highlighting this new line of comics would be a return of the classic ‘90s team book Young Justice that saw the release of its stellar first issue last Wednesday. The Return of Robin and Wonder Girl! Young Justice began as a riff on the Teen Titans when the previous team had moved on to being adults and staring in the Titans. A collection of teen heroes centered around the triumvirate of Superboy (Conner Kent), Robin (Tim Drake), and Impulse (Bart Allen) but later included the then new Wonder Girl (Cassie Sandsmark) and Arrowette all while being mentored by the android Red Tornado. It was a popular comic for a time and then slipped in sales and was cancelled as the team morphed into a new incarnation of the Teen Titans under Geoff Johns. The name resurfaced with the cartoon, recently restarted on the DC Universe online platform. 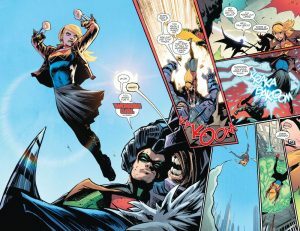 Young Justice #1 by Brian Michael Bendis and Patrick Gleason seemingly returns the comic to the core concept it was originally formed around. Rooted in the recent Crisis events Gemworld (from the classic ‘80s series Amethyst) have realized a lot of the catastrophes of their world is due to the Crisis events that have rebuilt and restructured he DC Multiverse ever since the original Crisis on Infinite Earths. So they have decided to take their anger out on the DC Universe, but which DC Universe is still a bit of a question. The invaders from Gemworld pick Metropolis for their attack, hoping to come into conflict with Earth’s Champion, Superman. Unfortunately for them Superman is absent from the city. Lucky for Metropolis standing in the way of Gemworld are a collection of teen heroes including Robin (Tim Drake), Wonder Girl, and Impulse from the original team and new characters Teen Lantern and Jenny Hex. 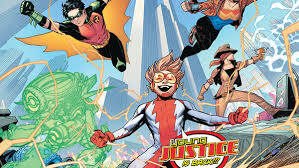 Just like team origin stories in the past these heroes happen to be in the vicinity of one another and by luck as well as circumstance throw in with one another to form the basis of a super team, in this case as Bart Allen lets everyone know, Young Justice. The invaders have no idea what hit them as chaos ensues and the issue ends with a spectacular cliffhanger. Impulse just couldn’t wait to say it. Young Justice #1 is a fun book that can be enjoyed by fans of the original series as well as new fans lured in by Bendis and Gleason’s names attached to the project. Just like he did for years on Ultimate Spider-Man and Miles Morales: the Ultimate Spider-Man Bendis writes realistic teen dialogue with great quips and excellent characterization. Gleason’s art is, as always, spectacular and the characters actually look like teenagers (which has been a problem in the past for those who remember the rightful outrage at the cover to the New 52’s cover to Teen Titans #1). It’s also nice to see the original trio in their classic uniforms, which also opens the question of are Wonder Comics set in an alternate earth. Bendis claims this is in continuity modern DC Universe, but we’ve been bait and switched before and honestly since Rebirth anything is possible. Either way, DC Universe or part of the Multiverse, Young Justice #1 is an exciting new comic that will hopefully headline a wonderful new line of comics. Verdict: Young Justice #1 is a fun new comic that will appeal to both fans of the classic book as well as attract and entertain new readers and in my opinion a Buy!